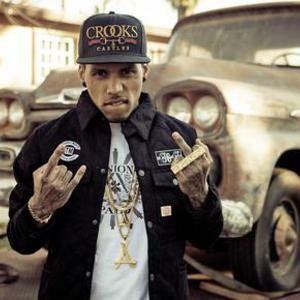 Born (April 1, 1986) And Raised In LA , Brian (Kid Ink) Collins formerly known as Rockstar. Kid Ink is an American recording artist, producer, and songwriter born and raised in Los Angeles, CA. Kid Ink has acquired a unique sense to music with both parents being raised on the East Coast. Emerging on the music scene in June 2010 he has created a brand new sound previously unfamiliar in Los Angeles area. Kid Ink is an American recording artist, producer, and songwriter born and raised in Los Angeles, CA. Kid Ink has acquired a unique sense to music with both parents being raised on the East Coast. Emerging on the music scene in June 2010 he has created a brand new sound previously unfamiliar in Los Angeles area. His debut mixtape "Crash Landing" hosted by DJ Ill Will & DJ Rockstar was an underground sensation which amassed well over 50k+ downloads in its first week of release. In addition, videos for songs "Blowing Swishers," "Keep It Rollin," "La La La" & "Run This" have all individually passed the 1 Million views milestone on Youtube. His 12 official videos combined have drawn in over 10 million + Youtube views in less than 10 months respectively. Kid Ink has been racking up a huge underground cult following independently over the last year including over 90k Facebook fans and 55k+ Twitter followers to date. Kid Ink is the franchise player for Tha Alumni Music Group alongside DJ ill Will & DJ Rockstar. Ink has recorded songs with some of the music industries biggest names including Chris Brown, Sean Kingston, Soulja Boy, Cory Gunz, Ray J, Red Cafe, Meek Mill, Machine Gun Kelly and many more. Outside of recording Kid Ink is also known for producing records and writing songs for other major artists. Kid Ink just released his highly anticipated official video for "Lowkey Poppin" which is the Street Single off his forthcoming "Daydreamer" album. "Daydreamer" will be available for Free Download online everywhere on June 21st and includes production from The Runners, Drumma Boy, Lex Luger, Tha Bizness, Jahlil Beats, Cardiak as well as features from Cory Gunz, Ray J, Gudda Gudda, Meek Mill, Bei Maejor, Dorrough, YG, Sean Kingston and more.